At the end of the street, that is to say Hope Street, is Mill Road in Cambridge, UK. This part of Cambridge is called Romsey and Mill Road is the main street going through it. The excessive traffic, pollution, and general misery inflicted by private motorised vehicles going up and down the street all day and night is a massive issue. But there is also a vibrant community of people living here with a wonderful range of cultures; anyone can call it home. The multitude of independent businesses and social places gives it a geniune and moving idendity that reflects its people. 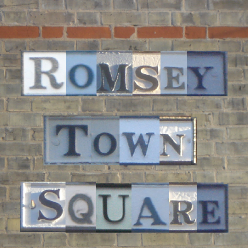 Now instead of a road full of nasty cars, imagine a central space where residents, visitors and friends can freely meet under the sky and breathe some fresh air: welcome to Romsey Town Square. Since it doesn't really exist at the moment, everyone can have their own idea of what it would be like. This is basically what I've captured in this song. Here you'll find someone else's perspective with a hand drawn Romsey Town Square map, and a video interview of local historian Allan Brigham about how the project is making slow progress with the city council. The picture was made up with letters from street signs around Mill Road, with the exception of the Q as I haven't found any in the area (this outsider comes from Russell Square in London). Also worth mentioning, it also was the first time I recorded my Olds Ambassador trumpet as an attempt to give it a new breath of jazz.